Our friend and neighbor asked me if I would like a Buttercup Squash from his garden, his very productive garden. Of course I would! Having never made one before, I was excited for the challenge. Cut the stem off and flip it over! Isn’t this a beautiful squash? There is a lot of “meaty” squash inside. 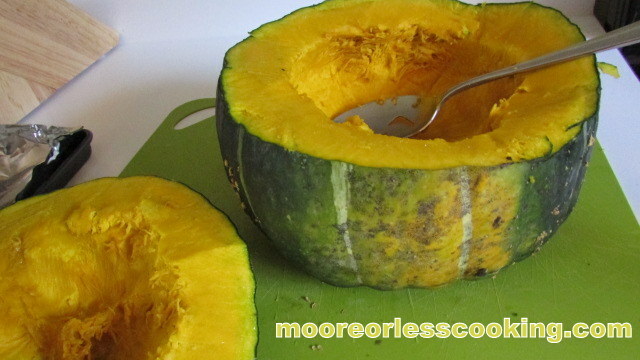 Cut off the top, like you would a pumpkin, scoop out the seeds and stringy “meat”. 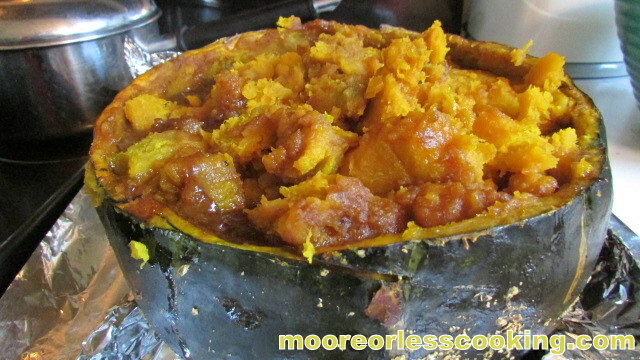 Place Butter, Molasses and Brown Sugar, Salt and Pepper inside the bottom half of squash. 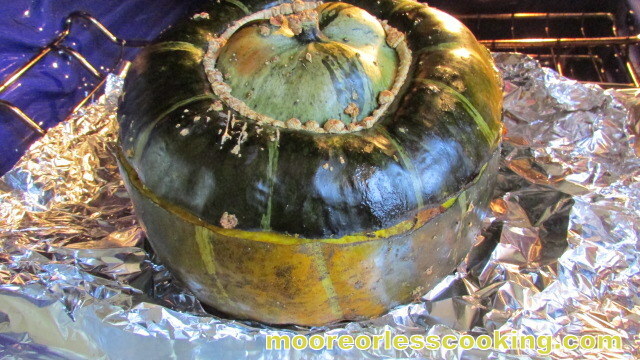 Place Top back on squash, completely cover with foil, place on foil lined baking sheet. Place in a preheated oven at 400 degrees for an hour to an hour and a half, depending on the size of the squash. I did take the foil off after an hour and let it bake uncovered for another half hour. Carefully remove foil, be careful of steam released when taking cover off the top. Use a pot holder or towel and carefully take off top of squash, scrape top and bottom carefully not going too deep and and cutting through. Leave a half inch along the bottom Gently using a soup spoon scoop the ” meaty ” part of the squash and melted butter and molasses and sugar. After scooping all “meat”, gently place lid back on top to keep warm. This is an easy recipe that just takes a little time to cut the squash open, clean out and fill with delicious ingredients, perfect for a holiday centerpiece. I’ve always been a bit nervous about how to cook buttercup squash but this recipe is encouraging me to give it a try. 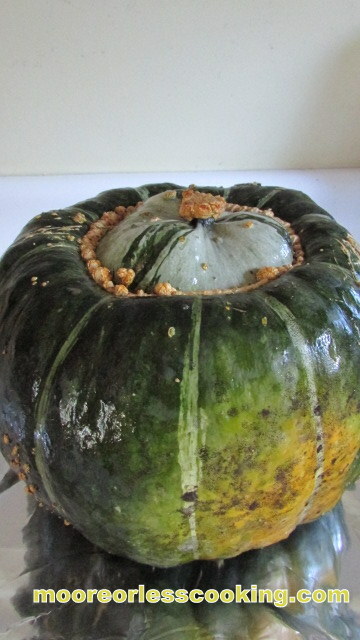 Your Baked Buttercup Squash looks so tasty, Nettie! Love the recipe and it does makes for a nice looking center piece on a holiday table! What a beautiful recipe. 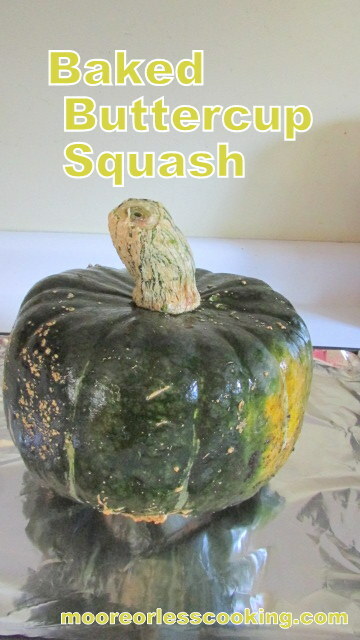 I am on a big squash kick so I am going to look for this squash at our produce market this week. 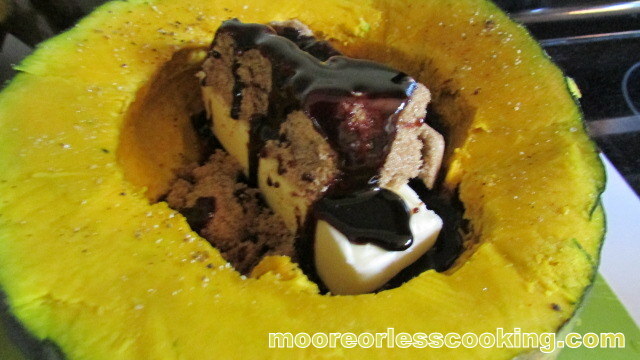 I adore squash and have never tried buttercup squash! I definitely must try this! Looks fabulous and perfect for fall!